Will Guardiola return to Barcelona? 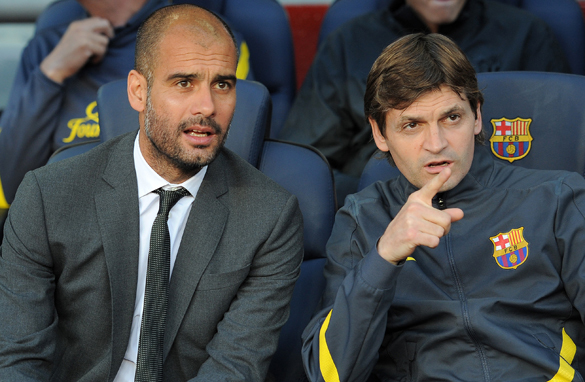 Pep Guardiola, left, has been linked with a return to Barcelona after a health scare for his successor Tito Vilanova. On Wednesday the football world was saddened by news that Barcelona manager Tito Vilanova suffered a relapse of a cancerous tumor which had been removed last year. He was due to have surgery on Thursday and is facing chemotherapy and radiotherapy treatment for the next six weeks. I hope he makes a speedy recovery and returns to the Barca bench as soon possible. The question now is, what happens to Barcelona? They had set a new club record by winning 15 and drawing one of their opening 16 league games. But what now? Can they keep their run going and continue to dominate Spanish football? And what about the European Champions League? As far as their next game is concerned, assistant Jordi Roura will take over for Saturday’s clash with Valladolid. After that we will have to wait and see. Doctors did say that the 44-year-old Vilanova could continue to work while he receives treatment. What I expect will happen is Vilanova’s technical staff will take care of most of the training, with Tito coming in to take charge of the team right before games take place. Obviously this will disrupt the day-to-day flow at the club, but in my opinion it shouldn’t disrupt the players’ performances on the field. What we need to realize is that Barcelona is about more than just one manager. There is a football philosophy in place at the Camp Nou which has been instilled into all players and coaches ever since they joined the club and is present at all times. Right now, the starting XI is comprised mostly of players who grew up at the club’s famed La Masia academy, so even if Tito isn’t there, they know what to do. It would be an exaggeration to say that the team plays on autopilot, but it’s not far from the truth. And when you have Leo Messi and his goals, you really don’t have to worry about too much. Is Vilanova coach of the year? What about Pep Guardiola? A lot of people have been speculating about his return to the club, but unless there is a major crisis in the new year I really don’t see that happening. He is on a sabbatical and, although he could visit Tito and the club a few times to raise morale, I don’t see Pep wanting take over in the dugout at this time. So my message to Barcelona fans is – don’t worry. You should not be concerned about your short-term future. The Blaugrana will win with or without Tito, and considering the league is pretty much wrapped up, I don’t see any major storms on the horizon. As far as the Champions League is concerned, the competition will not resume until February and by then Tito will have finished his therapy. Hopefully he will be sitting on the Barca bench when the Round of 16 kicks off with a knockout tie against Italian club AC Milan. Thanks Pedro. Unfortunately, we already knew that. First, I wish an early recovery of Tito. Yes, personally I have gone through chemo and radiation therapy and it's definitely NOT a nice experience in life but life goes on! I just hope that Tito will take care of himself first and in the meantime, Barca will find a solution for the best interest of this famed club. I am a Real Madrid fan but at this moment we all need to be united and wish Tito a very speedy recovery. And yes I agree with Pedro, Guardiola will not return and FCB will be just fine. They are great players. Pedro you are the best...please write more articles. And who is your next interview partner going to be , Íker Casillas ? PLEASE. I wish a quick recovery for my man Tito! Pedro, continue with your good and well documented articles, really I like the flow of words! Most of all the praise of Leo Messi. Continue my man. Thank you! I doubt Barca will even break stride professionally speaking whatever personal feelings the players have toward their stricken coach. Villanova's immediate success as manager is testament to the fact that this is actually a club coached by committee along strict guidelines. Sure, the boss must have the final say, but there is a Barca way of doing things with a system that is bigger than the influence of any one individual. History has shown that recurring success at many great clubs has been built on continuity, regardless of the personnel. Clearly Barca is a club with an established blueprint that repeatedly works and will continue to work whoever's at the helm until such time as it's superceded by a better system, which will happen one day, at the Camp Nou or elsewhere, but not in the forseeable future. Ironically, the efficiency of the Barca machine is why I don't want to see Pep Guardiola return there, at least not on a permanent basis. He's proven he can excel within the Blaugrana's set-up but to be considered a truly great coach, like Mourinho (Porto, Chelsea, Inter, Madrid) or Ferguson (Aberdeen and United), I believe he needs to succeed at another club where he creates a great side and builds a great system as opposed to inheriting a team and a philosophy that was already on an upward trajectory and just needed a light hand on the rudder. I don't doubt he's capable of that greatness, but the proof is in the pudding. Reports say Tito has recovered and has resumed duties. He has lot more to offer. May the young man enjoy good health in the New Year. Pep is not going to Chelsea. He just left barca , on good terms mind you. He is unlikely to start a new coaching position so fast (unless ofcourse the money is outrageous!). My bet is he and Messi link up again at another club after several years. .I wish quick recovery for Tito.God bless you man.